Wahyudi Putra Utama Department of Quantity Surveying, Universitas Bung Hatta, Jl. Sumatra Ulak Karang, Padang 25133, Indonesia. Sesmiwati Department of Quantity Surveying, Universitas Bung Hatta, Jl. Sumatra Ulak Karang, Padang 25133, Indonesia. Since the 1970s, researchers have investigated the international expansion of construction enterprises (IECE) from diverse dimensional issues, including the motivation. Different underlying reasons have been identified; however, attempts to reach a consensus of the motivation for IECE have been overlooked. This research solicits and overviews the motivation of construction enterprises with respect to overseas business expansion. 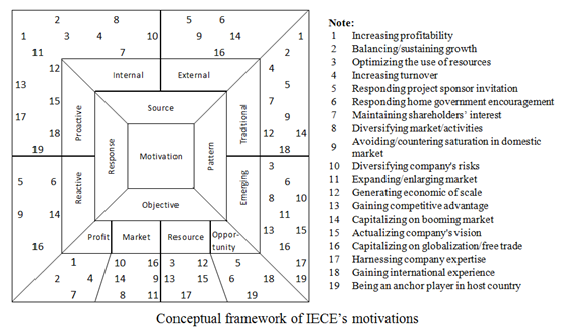 It recommends a conceptual framework of the generic motivation for IECE. Nineteen motives are specified and described in a systematic review of the literature on international construction studies. They are then structured into four categories: the source of motivation (internal or external); the pattern (traditional or emerging); the response (proactive or reactive); and the objective (profit, market, resource or opportunity). Further study of this field is equally important by involving the deterrent factors of motivation. Therefore, this paper advocates an investigation of the factors impeding IECE in further related studies. Internationalization is a term defined as the expanding process of companies’ business activities through a progressive course of actions to expand their participation in international markets and perform cross-national boundary transactions (Ahmad & Kitchen, 2008; Maqsoom et al., 2014). The term encompasses the attributes of various strategies within a multifaceted and multiple dimensional setting (Buckley & Ghauri, 1999). Different enterprise internationalization studies have resulted in several theories and models, such as the eclectic paradigm (Dunning, 1980) and network theory (Johanson & Mattsson, 1988). Much evidence suggests that an international visionary company has several strategic motivation behind its desire to enter foreign markets. Internationalization is believed to increase profitability (Fatemi, 1984); to improve performance (Grant, 1987); to minimize insolvency (Shaked, 1986); and to improve investors’ risk-return opportunities (Logue, 1982). In addition, according to Contractor (2012), the needs for the internationalization of enterprises are also underpinned by eight concepts, namely economies of production; global amortization scope; sourcing of cheaper inputs abroad; accessing foreign knowledge; risk reduction advantages of geographical diversification; tax avoidance opportunities; and gaining international experience. The existing knowledge in this field has been dominated mostly by the domain of general business and economics. Equally important as with other industries, studies of the motivation for the international expansion of construction enterprises (IECE) help to comprehend how such companies counter the rapid changes in the industry. In the context of the construction industry, several studies have been conducted to examine the internationalization of construction enterprises. For instance, using Dunning’s eclectic paradigm, Seymour (1987) and Cuervo and Pheng (2003) investigated construction firms in the UK and Singapore respectively. Oz (2001) adopted Porter’s Diamond model to examine the internationalization of Turkish companies, while Awil and Abdul-Aziz (2002) studied Malaysia contractors in international markets using stage growth theory. Although the investigations have substantially contributed to the promotion of the area of international construction business, very little attention has been devoted to understanding the reasons behind the expansion. To date, there has been no attempt to focus on soliciting and classifying expansion motivation in this context. This paper therefore examines the construction industry with a view to understanding the motivation of construction enterprises for expanding their business away from their domestic market. The paper aims to solicit and overview the motivation of construction enterprises with respect to overseas business expansion. Correspondingly, it intends to recommend a conceptual framework of studies on IECE for further investigation. This paper set out to identify and propose a conceptual framework for the international expansion motivation of construction enterprises. A literature search was undertaken to establish the expansion of motives related to overseas construction business from peer-reviewed journals and other academic publications. Nineteen motives were identified and categorized. A conceptual framework was developed by clustering motivation into four aspects, namely source, response, pattern and objective. Although the paper is based on a small number of sources, the findings offer an important insight into the realm of international construction knowledge. Each motive has a different level of importance, which depends on the internal and external environment of company. If it is hypothesized that expansion tends to be motivated by multiple reasons instead of a single motive, then the cumulative effect of each relevant motive constitutes the level of a company’s intention to penetrate foreign markets. However, the fact should be not ignored that every intention has certain negative factors, which may hinder a company from realizing its intentions. Therefore, a further hypothesis is that the level of expansion intention depends on the degree of company motivation for foreign market expansion, but affected by the factors hampering this motivation. A limitation of the study lies in the fact that it did not take into account the obstacles to international expansion. It is hypothesized that there are various critical hindrance factors which impede strategic decisions. Empirical studies on these factors are limited, especially for developing countries. Further investigation to identify and measure the deterrent factors in the international expansion of construction enterprises is strongly recommended. The study was funded by The Ministry of Science, Technology and Higher Education, Republic of Indonesia. The authors wish to thank Universitas Bung Hatta, Indonesia and The Hong Kong Polytechnic University for their support.